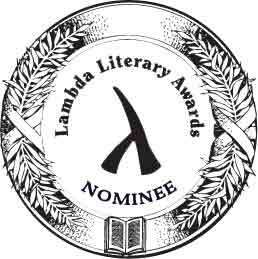 Charmed Lives was nominated for a Lambda Literary Award in the category Anthology. Kip Dollar & Toby Johnson attended the Gala Lambda Literary Awards Presentation in NYC, May 31, 2007. Toby's anthology CHARMED LIVES, co-edited by Steve Berman, was nominated for Best Anthology. The award went to the very deserving Love, Bourbon Street, edited by Herren & Willis. Editor Toby Johnson, author of GAY SPIRITUALTY, has collected an anthology for White Crane Books of inspirational fiction with upbeat twists and turns as well as autobiographical anecdotes and essays of positive and life-fulfilling aspects of gay experience. We're presenting stories that demonstrate the proposition that "Gay life is charmed" -- with "charm" having a rich variety of meanings. Modern society, including--and maybe especially-- gay culture recreates its own mythological traditions in "the old-fashioned way," by telling stories. Gay storytelling engender myths, allowing the negative elements that traditional society and religion has placed on homosexual identity to be transformed and uplifted. White Crane Books, an imprint of Lethe Press (Steve Berman, editor/publisher), announces an anthology of writings that do what good myths and storytelling are supposed to do: inspire and evoke meaning (especially out of despondency and darkness), to cheer, to place life in larger context, to hint at secret meanings--stories that inspire gay men to think positively about themselves, their lifestyles, their bodies (of any type), and, especially, their own spiritual paths. Postage & handling is included in the retail price of the book ($18). This purchase will be processed by the editor; you're welcome to request an autograph or inscription. There's a popular stereotype that homosexuality is a terrible curse and source of sorrow and suffering. Many of us have actually "suffered" from that stereotype; many of us have also transformed our attitudes about our aberrant sexual orientation and discovered our sexuality can bestow great joy, talent, success, love, and good fortune. Notice the layers of meaning in the word "charmed." There's a suggestion of "magick" and "destiny/good karma" -- but also simple usage as good luck and happiness. There's much to be grateful for in being gay. "Charm" also suggests urbanity and good taste. AND "charm" is a mysterious quality of quarks! 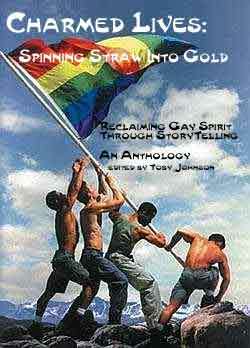 Editor Toby Johnson, author of GAY SPIRITUALTY has collected inspirational fiction with upbeat twists and turns along with autobiographical anecdotes and essays of positive and life-fulfilling aspects of gay experience and faith* . We're especially featuring fiction and literary short stories with a "Twilight Zone" or O. Henry sort of twist-- a little magic, a little sci-fi, a little romantic synchronicity. Such "twists" move the meaning of the story into the mythical. That is, after all, how the stories of religion have come down to us: by adding mystical, magical, miraculous details to the story the spiritual/moral wisdom is given eternal verity. In the realm of personal anecdote, we're presenting stories that demonstrate how people's lives have been "charmed" because they're gay. Let’s tell each other what a long straw we’ve drawn in this life because we’re gay. *Through our "faith" we have been saved. And we can save others from suffering by telling our positive stories. "Faith" means different things to different people. There is, of course, "faith" in a high power or deity, but gay men have also learned "faith" in friendship and in their own cultural accomplishments that have mattered to the community. The important attribute of the "faith" referenced in Charmed Lives is that it inspires others. Share what you have "faith" in as a happy and successful homosexual. Tell us how your gayness has enriched your life and allowed you to contribute to the world. Spin us a story of transformation. ** Mythical / magical stories have a way of placing their lesson in the realm of "eternal verities." Some of the old Twilight Zone stories (like the beautiful woman who thinks she's ugly because she's been transported into another dimension in which the criteria of beauty have been turned upside down) remain in collective memory long after their day. Religious stories are like this. The great myths--which claim veracity because of supernatural happenings (like Moses opening the Red Sea or Jesus healing the lepers)--are always about the deep dynamics of consciousness. Sci-fi and speculative fiction is one of the ways modern day writers declare that the lessons of their stories carry greater truth than just the dramatic plot, that they are about generalizable patterns that give meaning and direction to life. The intervention of fate and karma in human lives reveals a deep, "mystical" experience of those dynamics of consciousness. Gayness is surely a "dynamic of consciousness." The positive, enlightened, enlightening side of gayness can properly be written about in mythic language. This image of the gay boys raising the rainbow flag is only a whimical suggestion for a cover, but it captures the concept for the book: a twist, a re-creation of traditional imagery and myth with heroic gay meaning. This photo was created by photographer Ed Freeman for the cover of Frontiers Magazine, Los Angeles, in the mid-2000s. Contributor Sterling Houston died November 8, 2007, just a few weeks before Charmed Lives was released. Fellow Texas playwright Dennis Paddie wrote a beautiful tribute to Sterling which appeared in The Gay & Lesbian Review.